In this book you will find innovative ways to distill the wisdom of ordinary people to better guide public policy. Beyond elections, public participation, and citizen input, we must find a way to produce wise public policy. In Empowering Public Wisdom, lifelong activist Tom Atlee shows how diverse views can be engaged around public issues in ways that generate a coherent, shared “voice of the people,” infusing the political process with common sense and guiding intelligent decision making. True public wisdom results when the public—as a whole or in randomly selected mini-publics—engages in learning about, reflecting on, and discussing what needs to be taken into account to produce long-term, inclusive benefits. Such a process, Atlee suggests, moves us beyond partisanship to a place of collective responsibility for our shared destiny. Atlee presents a wide array of practical solutions, including citizen deliberative councils, conversational processes for mass public participation, and ideas for institutionalizing the power of public wisdom in our government. 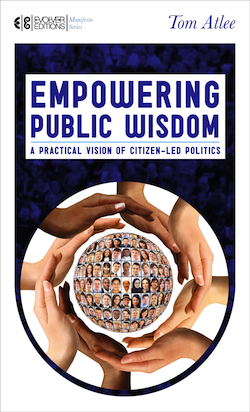 Combining a broad vision with practical solutions, Empowering Public Wisdom provides a unique and refreshing voice in the political arena. Atlee’s core approach is through citizen deliberative councils in which a small group of people randomly selected come together as a “mini-public” or a microcosm of the larger population. Citizen councils engage in the study of a public issue and make recommendations to public officials and the community, but disband afterward; when new issues arise, new councils are formed. Ultimately, Atlee aims even higher, suggesting a possible fourth branch of government to better balance our current democratic system. Empowering Public WIsdom was released August 7, 2012 by North Atlantic Books Evolver Editions. It is distributed by Random House and is available in bookstores and online. Order it from your favorite online bookseller or local bookstore today.